RF-4C Phantom II in SE Asia paint scheme. In the early 1960s, the USAF recognized the need for more tactical reconnaissance aircraft to reinforce the RF-101s then in service. 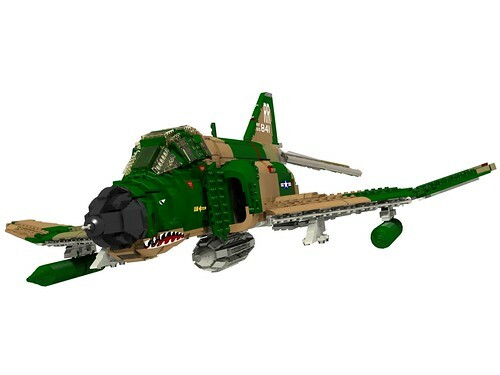 The USAF chose a modification of the F-4C fighter. The RF-4C development program began in 1962, and the first production aircraft made its initial flight on May 18, 1964. The Air Force officially accepted a total of 499 RF-4Cs. The RF-4C can carry a variety of cameras in three different stations in its nose section. It could take photos at both high and low altitude, day or night. The RF-4C carried no offensive armament, although during the last few years of its service some were fitted with four AIM-9 Sidewinder missiles for defense. Many were also tasked with a secondary nuclear weapons delivery role using the centerline pylon. The 16th Tactical Reconnaissance Squadron became the first operational unit to fly the RF-4C. In October 1965 that unit deployed to Southeast Asia to provide photographic reconnaissance of the growing conflict in South Vietnam. In the following years, RF-4Cs flew reconnaissance missions around the world, including Desert Shield/Desert Storm in Iraq in 1990-1991. The Air Force retired all of its RF-4Cs by 1995. This model represents aircraft RF-4C-25-MC- 65-0841 of the 38th TRS, 26th TRW, based in Rammstein, West Germany during NATO exercise Royal Flush XVI in October, 1971. It features detailed pilot and RSO cockpits with opening canopies, opening radome with antenna, opening inflight refuling receptacle on the aircraft's spine, deployable ram air turbine (RAT), retractable landing gear, and positionable leading edge flaps, airbrakes, flaps, flaperons, spoilerons, tailplanes, and tail hook. Ceiling: 55,200 ft.; Span: 38 ft. 5 in. Length: 62 ft. 10 in. ; Height: 16 ft. 6 in. Great version! Nice camo and shark's mouth. Excellent build. Nice to see one actually built in the 'plastic'! Can we have some more photos?